Star Wars: Queen's Shadow is a YA Novel written by E.K. Johnston. It was published by Disney-Lucasfilm Press. SUMMARY: The time has come for Padme to step down as Queen of Naboo. As she walks away from the throne, she discovers other opportunities in which she can still serve her home planet. Serving as a Republic Senator, Padme can be a representative for Naboo, and attempt to better the galaxy in the political ring. CHARACTER: A lot of us tend to paint Padme as a strong female character… but is she? Or is she just paranoid, relying on those around her to bail her out? The conclusion I’ve come to, is both. 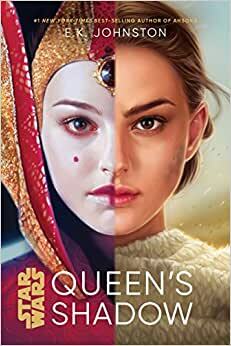 We know from The Phantom Menace that during the skirmish of Naboo with the Trade Federation, Queen Amadala has hand maidens, a body double, an altered voice for “Royalty’s sake and body double disguise.” This book pretty much shows us that she has always been paranoid, before the Trade Federation conflict. When Amadala makes her transition from Queen to Senator, it’s a bit tough for her make the adjustment. Padme uses the name Amadala as a stage name… an alias. When Padme is with her handmaidens behind closed doors, they talk about Amadala like she’s another person. It’s weird. Even as Senator, Padme has handmaidens, a body double, a security team, and even has someone tapping into the newsfeeds on Coruscant. OVERALL THOUGHTS: The book leads to a dead end. There is no climax. There is no real resolve. Some issues are tackled with the story… but overall, as a whole… the story leads to nothing. I don’t know if it’s supposed to tie into Clone Wars or if a second book is to be release… but the epilogue suggests that’s not going to happen. As I’m making my way through Clone Wars season one. I can’t recall any names that have been dropped in this book. I finished reading this book unsatisfied, underwhelmed, and a little confused. RATING: I give this book an F. I expected a powerful YA novel about Padme. I wanted to close this book and feel that she was a truly powerful and in control character. Yet, I close the book feeling that she was just paranoid, relying on others to help her gain success. I can’t recommend you read this book... But as a Star Wars diehard, it's best to go ahead and complete your library. And hey, you may like this book, everyone's taste is different. 5.0 out of 5 starsWe are brave, Your Highness. For girls who grew up with the original films, Princess Leia was the woman many aspired to be. We are seeing a new generation of young girls watch the Skywalker lightsaber fly straight into Rey’s hand and fine their inner strength through her journey. And for those of us who came of age with the prequel films, we had Padmé. A young queen who stood her ground and fought for what she believed in (in both a political arena and a literal one on Geonosis). Surrounded by her loyal friends and bodyguards, Padmé and her Handmaidens meant the world to those of us who saw ourselves in her strength and resolve. Queen’s Shadow embraces this Padmé and answers the question of what you do after you’ve ruled an entire planet. We see her enter a new arena of the Galactic Senate and must learn to navigate this new battlefield. Just like the films, she is never alone. This book belongs to her decoy Sabé just as much as it belongs to Padmé. It is truly a love letter to these amazing, often forgotten women of the Star Wars universe. 1.0 out of 5 starsLucasfilm swings and misses again..
Star Wars Explained did a book review about this book and it couldn’t have been further from reality. Their review on YouTube was glowing saying it was one of the best SW books of all time. Wrong. After the author’s previous book, Ahsoka (which was great), this book is a dumpster fire. There was really no new important canon content revealed, other than apparently Padme was bi-curious with Sabe? Why is LF so obsessed with who someone sleeps with at night? It’s definitely weird. Star Wars Explained has become intellectually dishonest. As long as you put a SW label on it, him and his sister will give it a positive review. 5.0 out of 5 starsAn Excellent Character Study of Padmé Amidala! E.K. Johnston’s “Star Wars: Queen’s Shadow” is the first of Disney’s new canon of “Star Wars” novels to take place prior to the Clone Wars. The story focuses on Padmé Amidala’s transition from Queen of Naboo to Galactic Senator. Discussing the change, Johnston writes, “Who was she, after all, when she was not Queen of Naboo? She had entered politics so early and with such zeal that she had no other identity” (pg. 16). The question of identity runs through the novel, with Padmé and her handmaidens adopting different personas, tones of voice, and poses depending on their audience or the situation as well as Padmé’s own identity change from leader of a planet to a single part of a much larger bureaucracy. Building upon the events of “Star Wars: Episode I – The Phantom Menace,” Johnston portrays Padmé working to free the enslaved people on Tatooine through Sabé as her agent, in particular trying to find Shmi Skywalker (pg. 115), though, unknown to her, Shmi is already with Cliegg at this time. Other links between the events of “The Phantom Menace” and “Star Wars: Episode II – Attack of the Clones” include Padmé enlisting R2-D2 to help her based on his bravery when she previously fled Naboo (pg. 122), building a coalition with Mon Mothma and Bail Organa (pg. 150), and sending Sabé to gather information at Dex’s Diner (pg. 161). Padmé also begins to experience the strains in her relationships with Rush Clovis and Mina Bonteri that will play a role in “Star Wars: The Clone Wars” (pgs. 178, 192). Johnston works to link this with other novels in the new canon through a scene in which Padmé visits Alderaan at the behest of Queen Breha, drawing upon material from Claudia Gray’s “Leia: Princess of Alderaan” (pg. 223-226). “‘And what if democracy does not return the favor?’ Padmé asked. “‘Then you must work to restore the democratic process,’ Organa said” (pgs. 191-192). The overall effect of “Queen’s Shadow” is one of the strongest character studies in the current “Star Wars” canon of novels. Like Johnston’s previous book and the work of Claudia Gray, these books demonstrate that the young adult novels often have more to offer than the works marketed to adult readers in their detailed examinations of the characters.